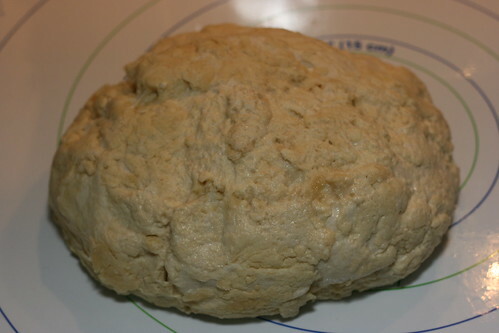 Here is the pate fermente after mixing and kneading. The preferment was left to rise for an hour, punched down, and retarded in the fridge. Then when I got home from work I took it out of the fridge so it could start warming up. 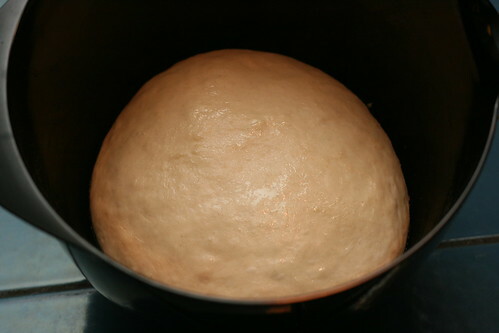 As it warmed up a bit before I cut it into pieces for the final dough it developed a huge bubble. 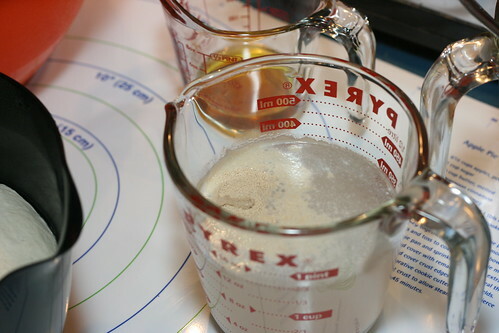 Then I cut the pate fermente up into about 10 small pieces, and measured out the wet and dry ingredients. 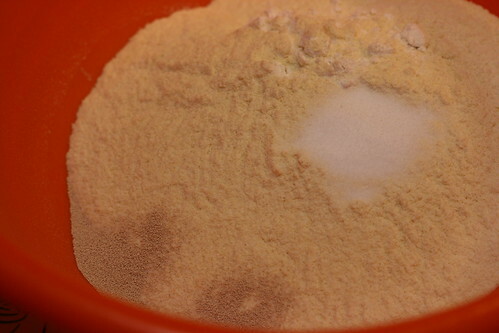 You can see the much more yellow color of the semolina flour here. Once the pate had warmed up, everything was mixed together yielding a large ball of dough, still somewhat splotchy in color here. 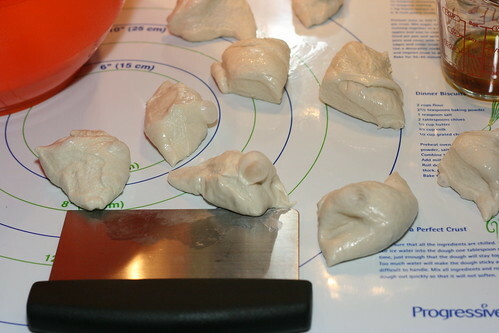 I let the dough rest for a few minutes to continue hydrating and loosen up some, then I began kneading it for around 10 minutes. 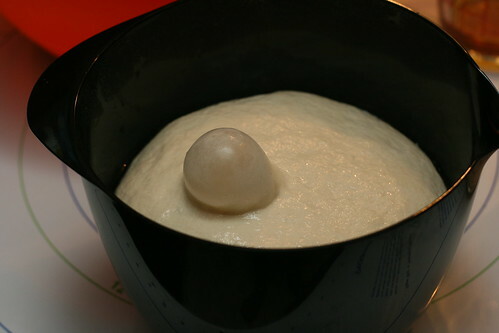 You can see the color is much more even now, with the kneading mixing the semolina and bread flour. 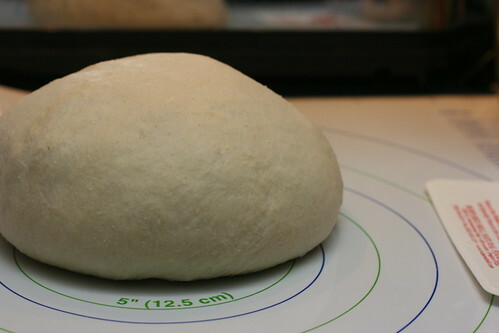 Finally, after putting the dough in a ball rise and then turning it out, it was time for shaping! You can see I had a little trouble getting the dough divided evenly into 3 pieces. I don’t have a picture of it, but they ended up melding together while being retarded in the fridge, apparently one sheet wasn’t enough space. I manged to seperate them in the oven once they had baked for a little bit. 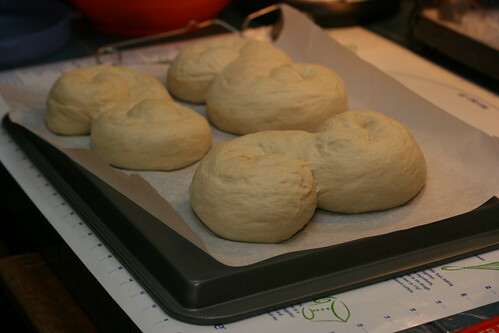 The spiral shape of the bread vanished a little bit during the retarding as well, I might try dusting it with a little bit more flour before shaping next time. 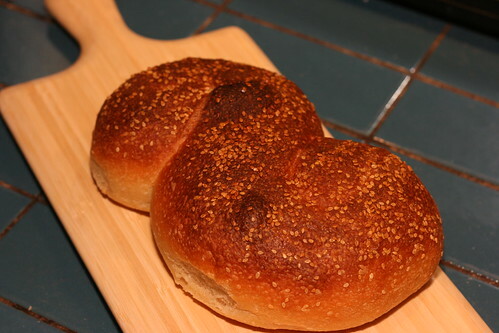 The loaves were yummy, the semolina really adding a little something extra to them. We made sandwiches and then toasted some and had it with olive oil, cracked pepper, and balsamic vinegar. love the purple basil ice cream! starting a Grow Cook cooking club, and also thinking about a blog. I need a challenge…working on veggie tarts/muffins…all veggies home grown..
am intri gued by the Daring Bakers…..and want to join….which recipe for semolina bread did you use? I used the recipe from The Bread Baker’s Apprentice by Peter Reinhart. 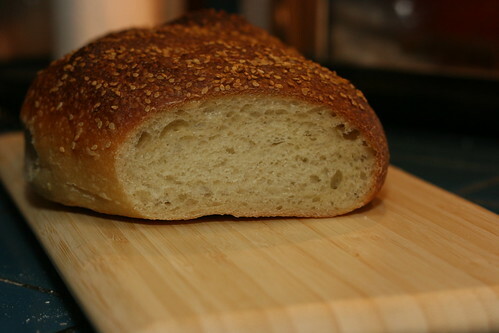 And also, while I don’t have a post up for it yet, I also used the recipe from BBA for pugliese. The recipe calls for up to 50% semolina, I went for the moon and did 100% and levain (sourdough starter) instead of instant yeast. It had the most wonderful golden color!